Over breakfast this morning the girls enquired as to my plans for Saturday... When i replied "sleepers" they instantly showed an intense interest & both had smiles from ear to ear. This is an unusual phenomena as my modelling does not normally invoke such a response. The mood soon changed when they realised that we were having a communication short circuit. I have been slowly amassing a rake of WSC sleeper wagons. These have all been bought ready to run from ebay & other sources. I figure that a 10 wagon train should satisfy my requirements. I have 8 now, so am nearly there. I know very little about the manufacturers of these models other than i figure there were two parties who released the models & at the least Trainmaster released a RTR version. I have had mixed luck as around half of the fleet purchased are poorly finished & the rest are just acceptable. Thems the breaks when buying online... I did try to find out if they were still available off the shelf....but all my enquiries led to nothing. While the overall appearance of these castings is to be commended, upon closer examination they just don't look right to my eyes. I have spent a few hours over the last few weeks researching these wagons both online & in publications i have on hand to get a feel for how they looked in service & in particular the loads. I decided to manufacture my own sleepers, fit a load to a wagon & if the appearance improved significantly i would then go ahead & fit out the whole fleet. The next step was to find out the "exact" dimensions of a timber sleeper in use on NSW system. as the appearance of each sleeper in the load was important as this was one of the visual faults with the castings as far as i was concerned & the loads are the focal point. 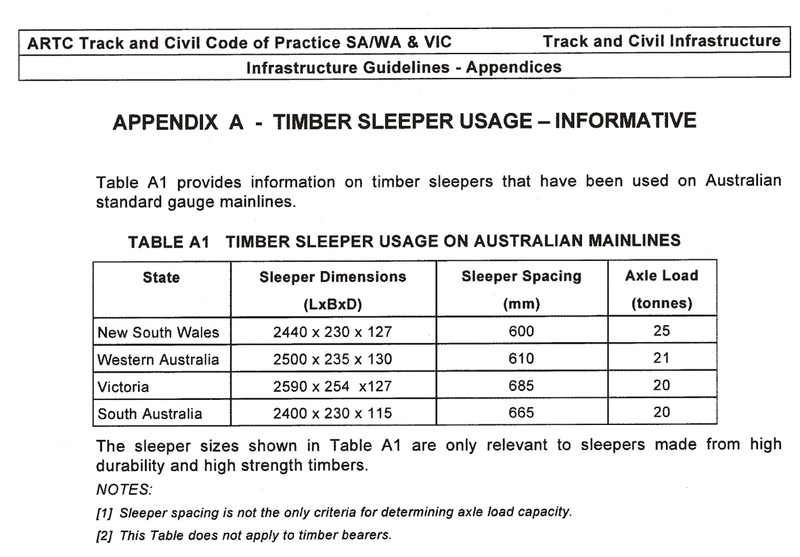 To some this may sound like a basic known & apart from length ( due to gauge differences ) one would assume that all timber sleepers used in the last say 50 years in Australia would be basically the same dimensions but i wanted a source document that i could refer to other than the old "around 2400mm long" storyline. Some may find this as boring as batshit....& indeed i may be morphing into a fine scaler....but the table below is interesting. Anyway....armed with this info i have laser cut the sleepers to NSW millimetre perfect in HO scale & set about creating stacks & this is where again my findings differ from the castings. All photographic evidence that i have perused shows that the sleepers as a full load were stacked 7 high & this again differs from the castings. The last piece of the puzzle is that i cannot find any photographic evidence showing the number of stacks across the wagon. When utilising my measurements it works out to be 10 stacks....whereas the castings show 14. Anyway with all that said i have attached some phots of progress & when the trial is finished a decision will be made if the effort has been worth it. Progress so far....& 9 wagons to go!!!??? The WSC wagon is available as a H0 kit from Sydney Hobbies (SHK02) at $45 ea. These are available from Gwydir Valley Models and Casula Hobbies. I recollect that the WSC was available as RTR under the Trainmaster label and these were also available from GVM. It might be worth a call to Warren Herbert to check if they are still available. Real timber sleepers were, of course, a natural product and so not all dimensions were uniform, depending on the source of timber and the sawmillers setup. Don’t be too hung up about variances in their dimensions, some variation was only natural. My recollection is that the standard cross section dimensions were 9” x 5” in oldspeak or 229mm x 127mm in todays language. This agrees well with the figures in your table. Your trial load looks reasonably realistic, well done.